How to make the best pumpkin spice latte at home with pumpkin puree, coffee, milk, and fall spices. Better than Starbucks! 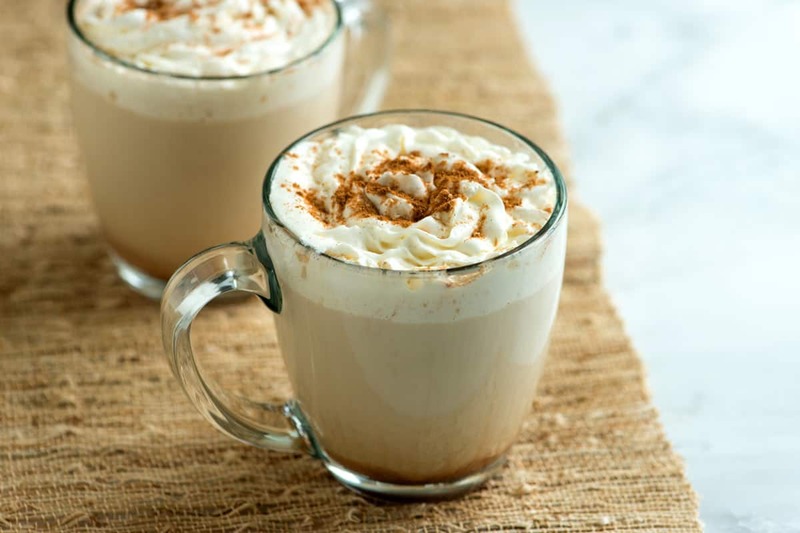 Jump to the Homemade Pumpkin Spice Latte Recipe or watch our quick video showing you how to make it. The moment Fall hits, we rush to our local coffee shop and order a pumpkin spice latte. We love them so much, we took it upon ourselves to try making it at home. 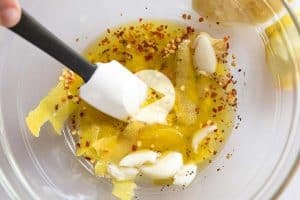 This recipe is easy and I bet you have most, if not everything, you need to make it at home right now. 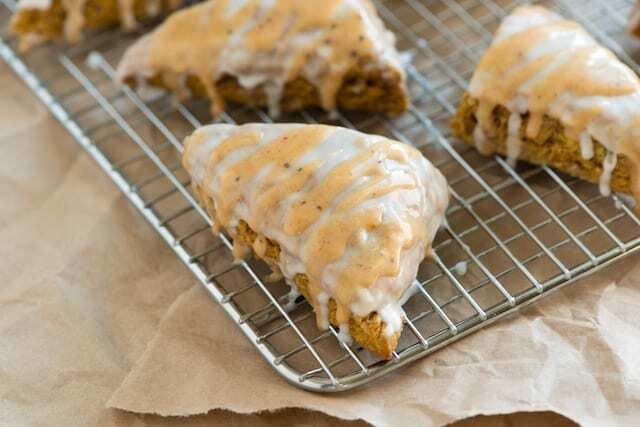 YOU MAY ALSO LIKE: These Homemade, Spiced Pumpkin Scones are incredible and have lots of 5-star reviews to prove it. Try them soon! This recipe comes together in under 10 minutes. Start by heating milk, pumpkin puree, and sugar on the stove. You can use whole, 2 %, skim, or dairy-free milk. Coconut or almond milk would be delicious. Then we add vanilla, pumpkin pie spices, and strong coffee. The mixture gets divided between two mugs and it’s time for whipped cream. Simple, quick, and no coffee shop lines. 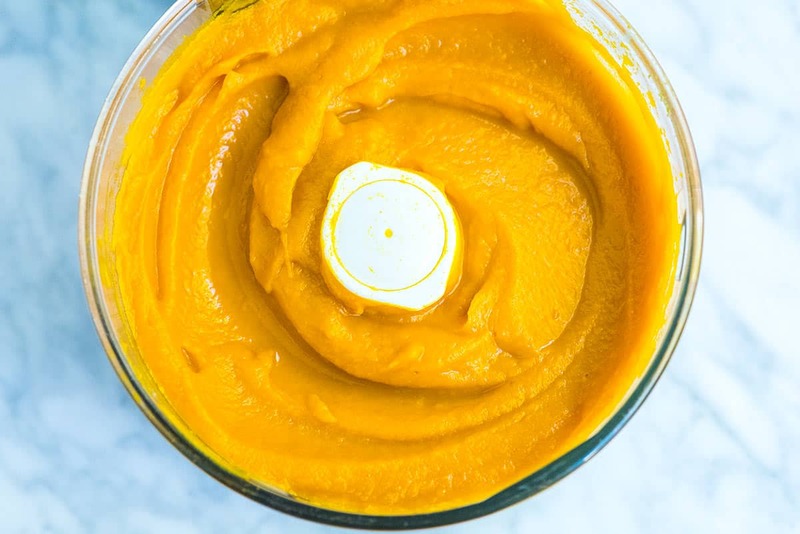 Use this homemade pumpkin puree for things like our Easy Pumpkin Mac and Cheese, Homemade Pumpkin Pancakes, Seriously Good Pumpkin Cupcakes and Pumpkin Pie. 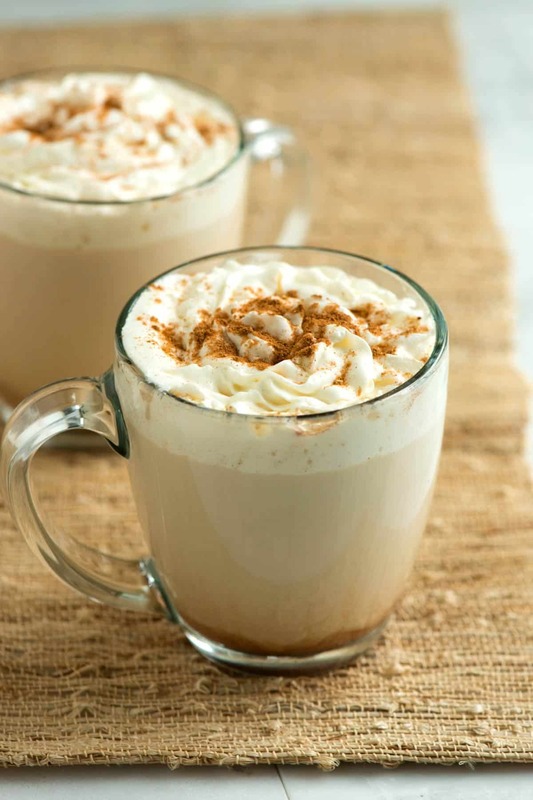 Make the popular coffee house pumpkin latte at home. Canned or homemade pumpkin puree both work well in this recipe. Add milk, pumpkin puree, and sugar to a saucepan over medium heat. Heat until hot, but do not boil. Remove the saucepan from the heat and whisk in the vanilla, pumpkin pie spice, and the coffee. Divide the mixture between two mugs. Top with whipped cream and a sprinkle of pumpkin pie spice. Milk: This tastes best with 2% or whole milk, but you can substitute with skim milk. Non-dairy milk like soy, almond, or coconut milk will also work. Sugar: This recipe calls for 1 to 3 tablespoons of sugar. How much you use is up to you. We tend to prefer less sugar in our drinks. You can also use a sugar substitute. Add this to taste. Pumpkin Pie Spice Blend: Find pumpkin pie spice at the store or make it at home. You likely have everything you need to make it already. Mix the following spices in a spice jar: 1 1/2 tablespoons ground cinnamon + 2 teaspoons ground ginger + 1/2 teaspoon ground nutmeg + a pinch of ground cloves. Nutrition Facts: The nutrition facts provided below are estimates. We have used the USDA Supertracker recipe calculator to calculate approximate values. We assumed 2% milk and 1 tablespoon of sugar. 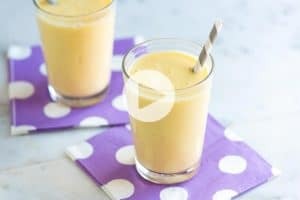 This is the best recipe! I’ve made others and they’re nothing in comparison. My only change to this one is that I don’t find the need to strain the pumpkin. I made this for my adult son today and he said that it was awesome! He thought it was even better than what you buy at the coffee shops. This was unbelievably good. I was shocked. I don’t care for pumpkin spice lattes but I made my pumpkin cheesecakes and thought why not make my husband his fav pie in a drink for this morning? It came out perfect. So comforting. I loved it and so did he. I always have pumpkin pie spice. So I had it in my pantry. Also used my leftover pumpkin pie puree I use for my cheesecakes. So perfect. Thank you for putting together this concoction lol. This is for sure a keeper. Thanks again. Great tasting. This is my fall pick this season. Others I have tried didn’t come close taste wise. Thank you for sharing. Perfect treat! Better than Starbucks. I could control the calories by changing milk and sugar substitute. Thank you for the recipe! Eveyone said it was good, but everyone used a substitution, lol. Anyone do it as written? How is it? I just did it as written for the second time today! I did it once yesterday but added too much pumpkin pie spice on accident lol. It tasted great if you do it as written though! Drinking mine rn! Made it – it was PERFECT. I added extra tablespoon or so of pumpkin when I was warming the milk. I also used a combination of so delicious coconut milk, and full fat coconut milk from a can (organic). Its just like starbucks, but better for me. Thanks for the recipe!!! Now I don’t have to wait until fall for this treat, and can make it healthy. Yum! I did use skim milk and drizzled caramel syrup on top of the whipped cream. Great recipe and it does keep well in the fridge if you want to make a bigger batch and reheat it. Thanks!! Yes, I made it for the first time. I used the recipe very simple. Very good and creamy. I used caramel syrup instead of vanilla. 😊 time to savor and enjoy!! I usually hit the milk mixture with my immersion blender to make it frothy. Otherwise, it’s perfect! This is good! The pumpkin flavor could be just a little stronger. I will make again. Thanks for the recipe. Really really good! I’m not a coffee person, so I switched the coffee out for tea, and I was golden. Only problem was the pumpkin flavor was very limited. Might add an extra tablespoon next time. SUPER EASY! Tastes amazing, fun to add to the recipe with more pumpkin puree, about 3 table spoons. Awesome Recipe! Thanks! 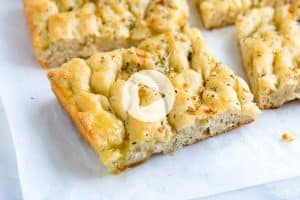 Could I make this in a large batch for the fridge and reheat it? Yes, that’s a great idea. This is seriously so much better than Starbucks- and completely guilt-free! I used 3 tsp of truvia sweetener in place of the sugar and that was perfect for me. Thanks for sharing this gem! Excellent!!! Thank you so much for a delicious recipe. Knowing what is in my latte makes me happy. I used all organic ingredients. I will make these often and feel good about drinking them. Such a warm and cozy drink. does it work to mix the non-coffee ingredients together and store it in the frig? then add to coffee as needed? Hi Ann, that is a great idea! I just made a single-serving dairy free version of this and used vanilla almond milk plus a splash of vanilla, a shot of espresso instead of coffee, and a bit of honey in place of the sugar. 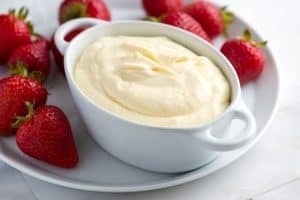 It was already amazing but then i remembered I had some vanilla toffuti ice cream in the freezer and put in a couple spoonfuls of that in place of the whipped cream and oh god…I wish this stuff could flow through my veins. Happy fall and thank you very much for the recipe! Made this only substituting the vanilla extract for maple syrup (simply because I just ran out of vanilla). Delicious!! Quick and easy to make! Thank you for sharing this with us pumpkin lovers! The flavour isn’t quite as strong as Starbucks(maybe use more strong coffee?) but other than that it’s very good! OH SOOOO GOOD!!!! I halved the recipe and made just one serving for myself. and instead of heating up the whole cup of milk in the pan, i heated up 1/2,and frothed the other half so I’d save some calories on the whipped cream. It was so perfect! You know what makes this super easy?? Using pumpkin butter bc it already has the spices in it! W O W…Made this using Pumpkin Butter from Trader Joe’s. This was excellent…just stirred into my already strong, hot coffee with cream, and topped with whipped cream. Thanks, Nicole!